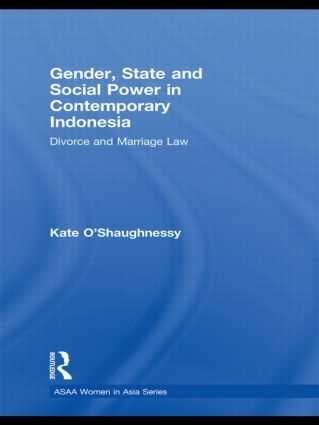 This book examines gender, state and social power in Indonesia, focusing in particular on state regulation of divorce from 1965 to 2005 and its impact on women. Indonesia experienced high divorce rates in the 1950s and 1960s, followed by a remarkable decline. Already falling divorce rates were reinforced by the 1974 Marriage Law, which for the first time regulated marriage for both Muslim and non-Muslim Indonesians and restricted access to divorce. This law defined the roles of men and women in Indonesian society, vesting household leadership with husbands and the management of the household with wives. Drawing on a wide selection of primary sources, including court records, legal codes, newspaper reports, fiction, interviews and case studies, this book provides a detailed historical account of this period of important social change, exploring fully the impact and operation of state regulation of divorce, including the New Order government’s aims in enacting this legal framework, its effects in practice and how it was utilised by citizens (both men and women) to advance their own agendas. It argues that the Marriage Law was a tool of social control enacted by the New Order government in response to the social upheaval and protests experienced in the mid 1970s. However, it also shows that state power was not hegemonic: it was both contested and co-opted by citizens, with men and women enjoying different degrees of autonomy from the state. This book explores all of these issues, providing important insights on the nature of the New Order regime, social power and gender relations, both during the years of its rule and since its collapse.